The kitchen is often seen as the focal point of the home—a place where the day begins, meals are cooked, families gather and holidays are made special. In addition to choosing the right flooring and cabinetry, one of the key elements that brings together the unique look and feel of a kitchen is the countertops. 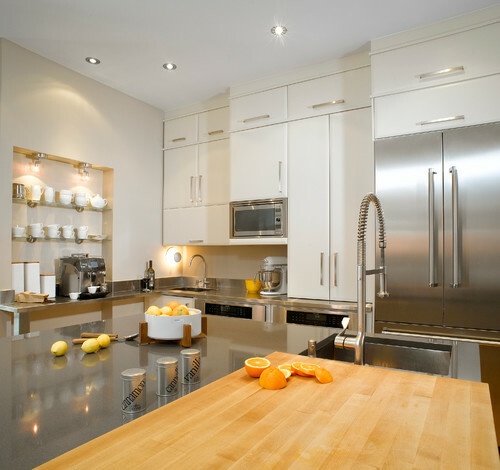 When choosing the best kitchen countertops, homeowners and designers will often be drawn to longstanding favorites such as granite or laminate. However, the range of options available is much broader nowadays, with materials ranging from recycled glass and semi-precious stone to salvaged wood and stainless steel. Ultimately, it comes down to the unique personality, vision and budget of the homeowner or developer. For the savings savvy, laminate is the obvious choice. Easy to install and available in a wide variety of colors and styles, modern laminate has come a long way from the tacky surfaces of yesterday. Laminate resists heat and stains well but is not as durable as some other materials, so it may require a little extra attention. 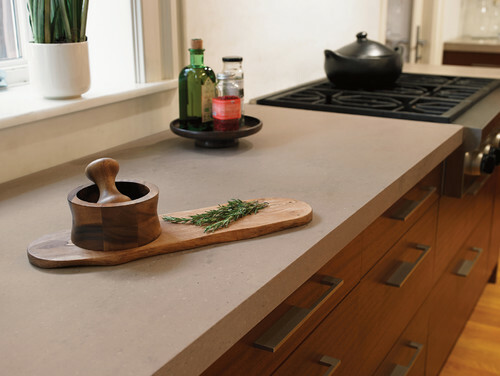 Other budget-friendly countertop options include wood, solid surface composite, tile and engineered stone. When it comes to durability, there is no beating granite. If properly sealed, it holds up incredibly well against heat, scratching, stains and heavy use. 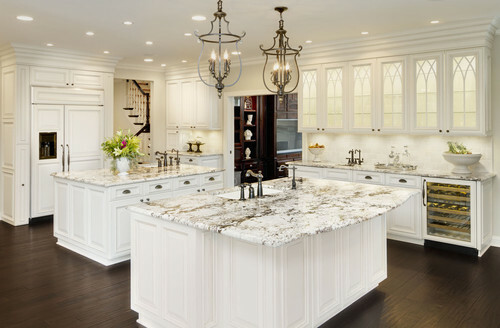 Style-wise, granite also has a lot to offer; unique grains and colors can match nearly any style or taste, and over the years granite has become more affordable as its popularity has endured. 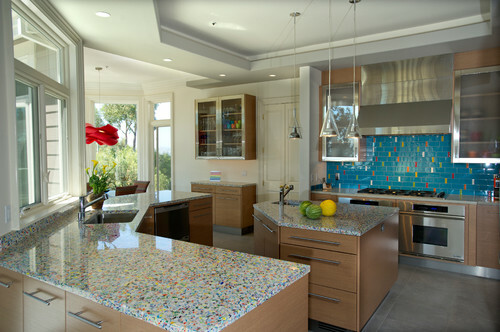 Other great high-use materials include stainless steel (a favorite among chefs) and recycled glass. Engineered stone is the clear winner here, with enough colors and patterns to match any style. The man-made material consists mainly of ground quartz combined with resins and pigments, and the non-porous surface resists stains and scratches well. Concrete also has a lot to offer in terms of design-forward materials. In addition to being highly durable, it can be dyed a range of colors and customized to fit any shape. Though pricier, marble and semi-precious stone countertops also make a stunning statement. A lot of modern homeowners, building owners, developers and designers are gravitating toward eco-friendly materials that are sustainably sourced, reduce waste and leave a smaller carbon footprint. 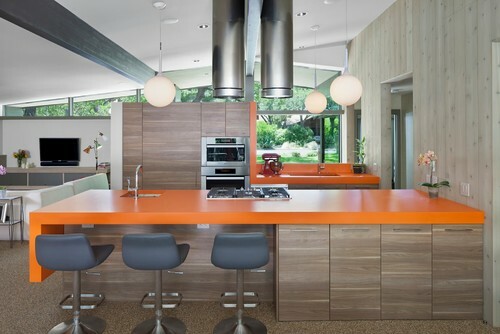 Some, including bamboo butcher block, recycled aluminum and recycled paper countertops are priced to fit smaller budgets, while others such as recycled glass (Vetrazzo) can be somewhat more expensive. However, eco-friendly materials can greatly contribute to the resale value of a home. Why Settle for Just One Style? While some prefer a monotone kitchen with a uniform design style, on-trend designers are experimenting with mixing materials, colors and textures to create a visually unique kitchen. 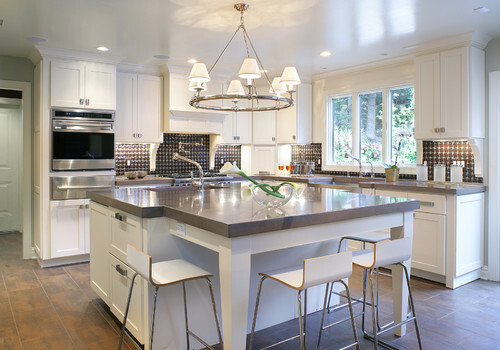 A semi-precious stone island, for example, becomes a striking centerpiece against white engineered stone countertops, and butcher block accents can be used to add warmth to a stainless steel kitchen.